, our building shook. Really shook. Coming from the Midwest, earthquakes have always intrigued me (I wondered things like: Does it really feel like you're standing next to a freight train? Answer: Yes). So being the earthquake-phile (or earthquake-noob) I am, I immediately jumped into Google Earth to check out what had happened. 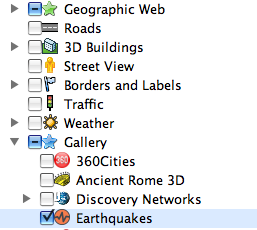 Thanks to the real-time USGS Earth feed, I was able to quickly find out the details. Opening up the 'Gallery' folder and clicking on 'Earthquakes' I was able to see that it was a magnitude 4.1 earthquake, with an epicenter just across the bay -- yikes! Armed with this information in real-time, I was able to share the details in real time with my jealous (and some not-so-jealous) friends still in the Midwest. At around 10:00am in Mountain View, our building shook. Really shook. Coming from the Midwest, earthquakes have always intrigued me (I wondered things like: Does it really feel like you're standing next to a freight train? Answer: Yes). So being the earthquake-phile (or earthquake-noob) I am, I immediately jumped into Google Earth to check out what had happened. 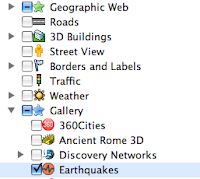 Thanks to the real-time USGS Earth feed, I was able to quickly find out the details. 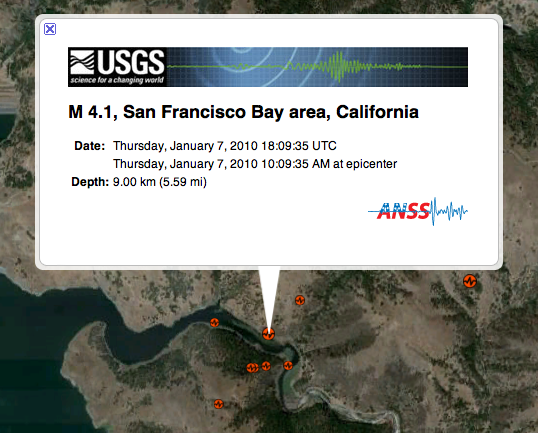 Opening up the 'Gallery' folder and clicking on 'Earthquakes' I was able to see that it was a magnitude 4.1 earthquake, with an epicenter just across the bay -- yikes!